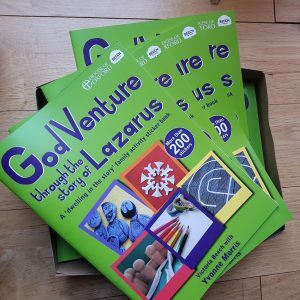 It’s a collaboration with Yvonne Morris from the Diocese of Oxford, and perfect for using during Lent due to the poster in the middle with 40 days of Bible verses and activities. Don’t worry! It’s designed to be easy to use, with only 1 or 2 verses to read each day, and it’s fine for you to miss a day or even a week. The aim of the book is to give you time and space to ‘dwell’ in the story of Lazarus, thinking and chatting about some questions, allowing yourself to go deeply into the wonderful Bible passages from John. The book has over 200 stickers which are used to help you explore the Bible passages and what they mean for your family. The book also has create ways to read the Bible together and pray, ways to include under 5s, plus brilliant wondering questions (from Yvonne!) to help you think and chat about the Bible verses. You can see more details and get your copy here or buy copies for friends (2 for £10) or a bundle of 10 or 50 for families at your church.